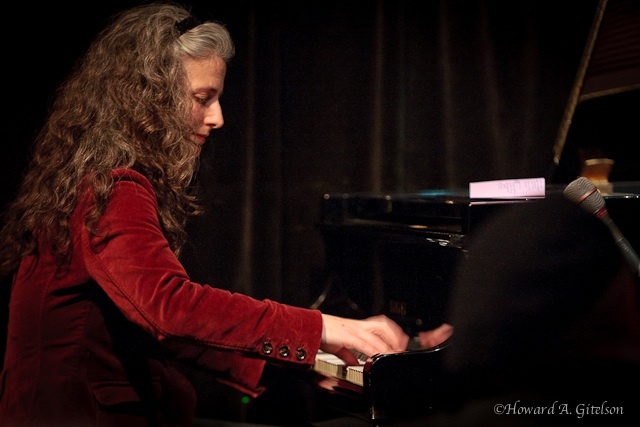 Pianist Mary Louise Knutson has been a staple of the Twin Cities jazz scene for almost two decades. Her melodic soloing and her rhythmic sensibilities have led to her performing with quite a few visiting artists, including Dizzy Gillespie, Bobby McFerrin, Nicolas Payton, Diane Reeves, and Doc Severinsen. She’s also played for shows by artists like Smokey Robinson, Sam Moore (of Sam & Dave), and Trisha Yearwood. When she isn’t performing with visiting artists, Knutson works with a number of Twin Cities groups including the JazzMN Orchestra and vocalists such as Connie Evingson and Debbie Duncan. She also leads her own trio, with the seamless rhythm section of Gordon Johnson on bass and Phil Hey on drums. It is this configuration which drives her new CD, In the Bubble, though drummers Greg Schutte and Craig O’Hara step in for a few tunes. 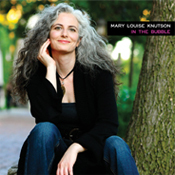 The CD contains Knutson originals as well as standards. The result is a swinging affair, with moods that range from meditative to joyous, all buoyed by Knutson’s warm, soulful touch. This is an album that will undoubtedly receive airplay on stations throughout the nation. Ms Knutson stopped by Rhythm and Grooves on Saturday, November 19, 2011 to talk about upcoming CD release parties at The Artists’ Quarter in Saint Paul and the Dakota Jazz Club in Minneapolis. This is a slightly edited version of our interview. LE: I want to welcome to the KFAI Studio Mary Louise Knutson. How are you today? LE: Is that musician’s time? LE: You have a brand new album out called In the Bubble. You notice I’m calling it an album and not a CD. MLK: Oh, I do. I like the way that sounds. LE: You’ve been around a bit, but people don’t necessarily find out about your background unless they go to your website. Give us a little bit of your background, and when you came to the Twin Cities, that sort of thing. MLK: Okay. Well… I actually grew up being a classical pianist. I started playing piano when I was four, and took lessons all the way through college. I got a degree in classical music. While I was at college I was exposed to jazz, and really started liking it and got involved in some of the jazz ensembles. I didn’t know how to play it at all, but at that level they usually give you written-out music anyway. So I could read it and play in a big band or other groups, and by the end of college I knew I wanted to be a jazz pianist. LE: What was it about jazz that intrigued you so much? MLK: Just the feel of it. I could feel something. Being able to play with my friends also was a factor. Here’s something we could do together. I guess in the classical world, we could play quartets or I could accompany people or whatever. We could do that there, but I don’t know. There was just a sort of fun energy about it (jazz) that I appreciated. I loved the voicing’s on the piano, the rich harmonies and the rhythms – all that. So I knew I wanted to be a jazz pianist and after I graduated I thought I’m just going to sit down and study this music. That’s what I did. I moved to Minneapolis. At that point I was going to school at Lawrence University in Appleton Wisconsin and I moved to Minneapolis. Didn’t know anyone here. I just found an apartment and had a little keyboard and started practicing. I knew at some point I needed to start going to jam sessions. I mean… it was hard. I was totally new at it. It was frightening to improvise. But I’ve worked at it over the years and I should know a little bit about it by now. (laughs) Twenty years I’ve been playing jazz. LE: You’ve also shown talent at composition and have gotten awards for your writing. Is that something you studied separately? Did it come out of what you learned as a classical pianist? How did that come about? MLK: Well, let me mention a great teacher of mine, Chris Granias. Chris is actually a teacher here in the Twin Cities, at the Perpich Center for the Arts, but I grew up in Wisconsin, and he was there teaching. He taught me and he was the first one to ask me to try composing. He gave me an assignment and he came back and was very supportive. He opened that possibility in me, and then from there I took a couple of composition and arranging classes at college, and really enjoy exploring what is in me and what I have to say. It’s an enjoyable act to work on compositions. LE: How did this album come about? MLK: Well, I produced a CD (Call Me When You Get There) ten years ago, almost to the date. That was my first CD as a leader with my trio. It’s been ten years. It was time. I’ve worked on a lot of other people’s projects in the meantime, but I really wanted to get back to composing again, and just sort of documenting where I am now. It’s been a while so it really is mostly about that – wanting to document and wanting to share something with people that they could take home with them. LE: The first track on the CD is “It Could Happen to You,” a Jimmy Van Huesen tune that you’ve arranged with a couple of significant tempo changes. Gordy Johnson is on bass and Phil Hey is on drums. Was it fun to work out your arrangement? LE: You’ve had the opportunity to play with many visiting artists as well as almost all the artists in town, and you’ve done some touring. What happens when you play with a visiting artist? What do you take out of that? MLK: The biggest thing I think is the energy that they play with. That inspires me. I watch them walk on stage. That’s one thing – how they carry themselves. Often these are national, international stars. They have a way of carrying themselves and then when they perform you can feel their energy. I pay attention to that and think, if that’s where I want to be, what do I have to do to step up my game to match that. If I’m playing with them, I want to bring my energy up to that level, or do that on a consistent basis from now on. I love that about playing with national artists. I learn a lot. LE: Do you find it difficult to match that energy? MLK: Usually, they’re very gracious. I’m thinking back to a time years ago when I studied with Kenny Werner, just a lesson or two, and I remember standing behind him. The energy he played with, the volume he played with – not just that you want to play loud – he was just playing with his whole being. That inspired me. I thought, oh, that’s the level of energy or emotion that you need to put out when you’re playing. It sort of gave me permission to let more of myself out. And so when I play with national artists, they’re giving a lot of their own energy, and I’m reminded to do that. Every time I play with them it’s just: put it all out there on the table. LE: You were talking about visiting artists. Will you be playing with someone who’s coming in soon? MLK: I’ ll be playing with Doc Severinsen, coming up Friday the 9th of December, and Sunday the 11th of December at Orchestra Hall. He actually asked me to go on tour with him this last summer, but the tour never materialized, so I didn’t get to go. LE: But that was great that you were asked. MLK: Yeah, what a treat. LE: One of your original compositions on the new CD is “Can You Hear Me Now.” What’s the inspiration for this one? MLK: Well, there is a little story behind this. One time when I was trying to compose some new music, I was really stuck. I was sitting at the piano for days and weeks and nothing was coming to me, and I decided to use a sort of composing trick that I swore I never would use. It’s where you assign numbers to the pitches. Take a scale, and the first step of the scale is number one, then number two, three four, all the way up the scale. Then you take a series of numbers, like your social security number, or your phone number, and see if those numbers make a melody. So, I was desperate, and took my cell phone number, and tried to see if it made a melody, and it did. I worked with it for a while, and am really happy with the tune that came out of it. I titled it “Can You Hear Me Now” after the ad. I was glad to use it and to get out of my rut. It does work sometimes. LE: How long did it take you to put this album (In the Bubble) together? MLK: I started composing and arranging for it about five years ago. With a full time job as a musician, there’s a lot to do. People might not think that, but it’s busy. You’re always practicing and rehearsing for other people’s shows and stuff. So I was trying to squeeze in composing and arranging. I kept saying, oh, I’ll have an album out. I’ll have an album out next year. It just kept going on and on. It felt like it took a long time. It did take a long time to put it together. LE: Once you got into the studio, did that go fairly quickly? LE: We’re always our own worst critics, aren’t we? LE: Thank you so very much for coming by. This has been delightful. MLK: Thank you very much. This entry was posted on Sunday, November 27th, 2011 at 11:40 am and is filed under Interviews. You can follow any responses to this entry through the RSS 2.0 feed. You can leave a response, or trackback from your own site.